4 years ago I’ve started working on Intermarried. This week the book is being released in Europe. What follows is the afterword I wrote for the book. In 2007, I was a student at ICP and worked on The City Elders, a project about older people living in New York City. That is how I first met Beatrice Rippy, a former opera singer. Her late husband, Carroll Hollister, was a piano player, and from the many family photos in her apartment, I realized that they were intermarried. However, since that wasn’t the subject of my project, we haven’t talked about it much. 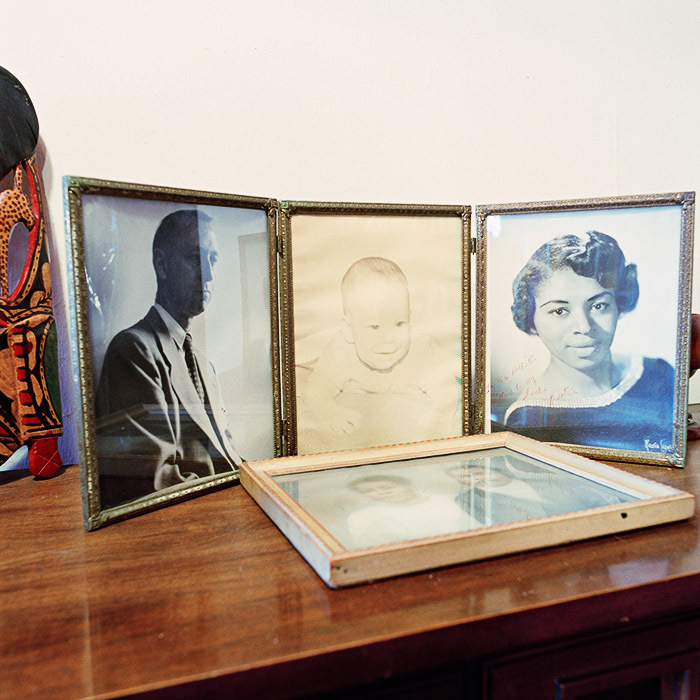 At the time, I did make the photograph Frames that for me has always been about intermarriage, but when put in the context of The City Elders, hardly anyone seemed to notice this. Beatrice and I became friends and when I started working on Intermarried, I asked her about her marriage to Carroll back in the late fifties, at a time when interracial marriages were prohibited in more than 20 states in the US. In response, she put on her great smile and told me that they always did things their way. When Intermarried started to shape into the book it is today, combining texts and images, I asked Beatrice if she would fill out a questionnaire that I could use for the book. She agreed, but preferred to have a face-to-face conversation that I would record and later transcribe. Our interview never took place. Beatrice passed away less than two weeks after that. She was 82. I feel very fortunate to have met Beatrice and been able to count her as a friend. She was, and still is, a great source of inspiration. A wise and courageous woman, she taught me a thing or two about endurance, resilience, family, love and happiness. This book is dedicated to her. As mentioned elsewhere, this project was triggered by a media campaign of the State of Israel that targeted Jews outside of Israel who were ‘lost’ to intermarriage. As I am concluding this book, another campaign that touches upon intermarriage – this time far more subtly – attracts much media attention. The current controversy involves a Cheerios TV ad featuring an interracial family. Although initially the media’s focus was on the negative responses the ad received on YouTube, it has recently shifted to the wide public support that followed the backlash. The public discourse around this cereal ad serves as an important reminder that the issue of marriage – of any kind – may and should be discussed at our kitchen table. And this may be the main idea behind Intermarried – to create a platform for thinking and talking about issues that are very personal but have vast social and political implications.